Louis Walsh has already lost two of his acts in the X Factor double elimination last weekend. Sixteen acts are now down to 14. Blonde Electra and Overload Generation were the unlucky losers, and it was the public that sent them home. There’s nothing like getting your hopes built up and to have them crash down the first week of live competition. It will be back to the normal for those eliminated while the remaining 14 hone their skills and try to gain that professionalism they need to woo the audience to get enough votes to sustain their effort. Singing competitions are just that; most everybody has to lose as there can only be one winner. How cruel? The first results show of The X Factor 2014 was a double elimination – meaning two acts had to leave with only one live week under their belts. And it was Blonde Electra and Overload Generation who had their dreams crushed. Which also means that Louis Walsh has already had his acts cut in half! The massive 16 acts had to be trimmed down to only 14 and the zany girl duo received the fewest public votes and had to leave immediately. They obviously hadn’t struck the right chord with the audiences at home – remember this is the first time the public has had a chance to judge the chosen acts. The show kicked off with the traditional joint song (still keeping that in then guys?) and there were so many singers on stage it was like watching a school concert. Still their Anything Could Happen was fun even if you were distracted by all the different acts. After performances by Pharrell and Taylor Swift it was down to business. Over 2million votes were cast and the wannabes looked thrilled by every single one of them as they were put through to the next round, Chloe Jasmine and Stevi Richie looking most surprised of all! After Blonde Electra had said their goodbyes, out of the final remaining three acts Stephanie Nala and Overload Generation had to perform again for the judges vote. It seems the early popular boy band might have lost a few votes to new favourites Stereo Kicks? Their version of A Thousand Years got off to a shaky start and sounded a little deflated. Stephanie’s distinctive voice shone through as she sang Have You Ever? and it was obviously enough because she was saved. Oh that red outfit that Cheryl wore — what a standout she was this week on X Factor. Combined with red shoes and red lipstick, Cheryl came to impress and she sure did. Louis Walsh is licking his wounds once again, but my question is why doesn’t he ever get given the hottest group — the young men or women. 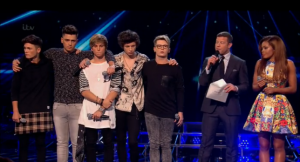 Groups have traditionally had a hard time winning X Factor. They have won in the past but relatively few have over the course of the competition. Our condolences go out to Louis and the two bands that were eliminated. Better luck next week Louis!